Description: The village is approx 20km. 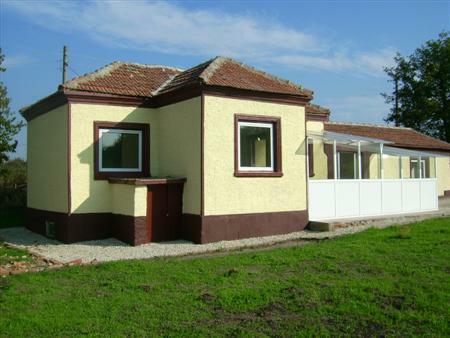 from the market town of Dobrich, 48km to the beach and 62km from the airport at Varna. The region is ecologically clean, there are all the amenities and communications needed. The Traditional Bulgarian Style House Consists: Big glaze veranda (conservatory), an ideal place for coffee time and for winter garden. It has two entrances, one for the ground level where you can find the living room, a kitchen and a bathroom/WC. The second entrance leads to the two bedrooms, which have a separate bathroom. The house is finished with painted walls with latex, PVC window frames, laminate floorings in the bedrooms, tile floorings in the rest of the premises, equipped bathroom. The house has beautiful landscaped garden 1970 sq.m, enclosed with stone walls and wooden fence, with 2 parking lots. The garden is large and enough to have swimming pool or another house. The property is easily accessible through asphalt road. All services, such as water and electricity are connected to the property. There is a septic tank. The sea resorts Balchik and Albena are about 48 km away and so are the new golf courses and that makes the property suitable for a holiday home or a peaceful place to retire. ONE NOT TO MISS OUT !